Under the Radar is excited to announce the full details of the Best of 2014 Issue, which is about to hit newsstands and will be out all of January and February. 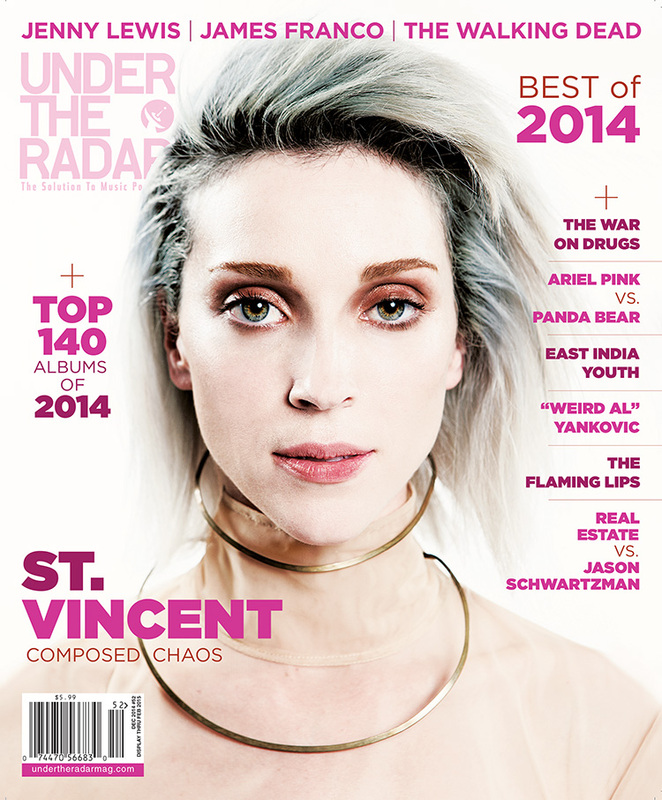 It features St. Vincent on the cover and interviews with some of the artists behind 2014's best albums. Some of the highlights of the issue include our Top 140 Albums of 2014 list and the 2014 Artist Survey section, which features Q&As with The Flaming Lips, of Montreal, alt-J, Sharon Van Etten, and many others. Jason Schwartzman and Real Estate's Martin Courtney interview each other and there's also a joint interview between Ariel Pink and Panda Bear. There's an in-depth article on The Walking Dead that includes interviews with actors Andrew Lincoln and Melissa McBride, creator Robert Kirkman, executive producer Gale Anne Hurd, and several other cast members. Other interviews include Jenny Lewis, James Franco, The War on Drugs, "Weird Al" Yankovic, and East India Youth. The issue features an in-depth 8-page cover story on St. Vincent. Our writer Matt Fink talks to Annie Clark about her incredible year and St. Vincent, one of 2014's most acclaimed albums. Tommy Kearns photographed Clark in New York City for the article. Our writers pick the 140 best albums of 2014, with their thoughts on each of the Top 30 albums. The print issue ends with a tribute to late legendary music photographer, David Redfern. The digital version of the issue (available via iTunes and Zinio, and for iPads, iPhones, Macs, and PCs) also features extra Artist Surveys and reviews not found in the print magazine. Click here to buy the digital version of the issue (via iTunes and for iPads and iPhones). Click here to subscribe to the digital version of Under the Radar (via iTunes and for iPads and iPhones).